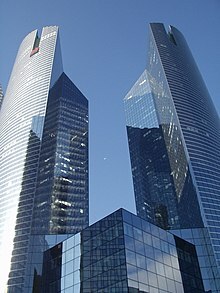 Société Générale S.A. (French: [sɔ.sje.te ʒe.ne.ʁal]), often nicknamed "SocGen" (French: [soc-ʒen]), is a French multinational investment bank and financial services company headquartered in Paris, France. The company is a universal bank and has divisions supporting French Networks, Global Transaction Banking, International Retail Banking, Financial Services, Corporate and Investment Banking, Private Banking, Asset Management and Securities Services. Société Générale is France's third largest bank by total assets, sixth largest in Europe or seventeenth by market capitalization. The company is a component of the Euro Stoxx 50 stock market index. It is known as one of the Trois Vieilles ("Old Three") of French banking, along with BNP Paribas and Crédit Lyonnais. The bank was founded by a group of industrialists and financiers during the Second Empire, on May 4, 1864. The bank's first chairman was the prominent industrialist Eugène Schneider (1805–1875), followed by Edward Charles Blount. The number of sales outlets rose from 1,005 in 1913 to 1,457 in 1933 (including those operated by Sogenal [fr]). 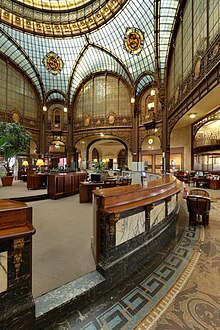 Thanks also to the dynamism of supervisory and management staff at head office and in the branch offices it moved ahead of Crédit Lyonnais (in terms of deposits collected and loans distributed) between 1921 and 1928. To satisfy the requirements of investing companies, Société Générale created a subsidiary, Calif, specialised in medium-term credit in 1928. In 1998 Société Générale paid $540 million in cash to acquire Cowen & Company, a New York investment bank that specialized in the health care, technology and communications industries. Cowen was over by the Societe Generale Securities Corporation, the French bank's New York investment bank, and renamed the SG Cowen Securities Corporation. Joseph M. Cohen, Cowen's chief executive became its chairman, and Curtis R. Welling, an investment banker from Societe Generale's New York office became president and chief executive. In 1998, Société Générale set up Retail Banking outside France as a separate division, underscoring the Group's resolve to make this business one of its strategic development axes. This activity was also strengthened in 1999 through the acquisitions made in Romania (BRD – Groupe Société Générale), Bulgaria (Société Générale Expresbank) and Madagascar. This external growth strategy has been manifested through acquisitions in Central Europe (Komerční Banka in the Czech Republic and SKB Banka [sl] in Slovenia) in 2001. Investment banking at Societe Generale in Russia was run by Jacques Der Megreditchian until 2000  At that time, Société Générale became officially concerned with money laundering scandal and underground economy. Africa is also a major area of interest for the bank, with the 2002 purchase of Eqdom in Morocco (the market leader in consumer lending) and Union Internationale de Banques [fr] in Tunisia. In addition, 51 percent of SSB Bank in Ghana in 2003 and 50 percent of Geniki Bank in Greece in 2004 were acquired . In terms of specialized financial services, a department created in mid-2001, the purchase of two Deutsche Bank subsidiaries, ALD Automotive for multi-brand auto leasing and financing and GEFA for corporate sales financing enabled Société Générale to increase its European presence in these sectors. In 2002, it continued to pursue its external growth strategy by purchasing Hertz Lease, a European subsidiary specializing in long-term leasing and fleet management for Ford Motor Company vehicles. ^ a b c d e "Consolidated Financial Statements 2017" (PDF). Société Générale. Retrieved June 26, 2018. ^ Kohene, David (November 5, 2016). "SocGen to sell Polish arm to Millennium". Financial Times. Retrieved November 1, 2018. ^ "The Biggest French Banks by Total Assets". Banks around the World. Retrieved February 27, 2015. ^ "The Largest European Banks 2014". Banks around the World. Retrieved February 27, 2015. ^ "The 20 largest banks in Europe by market capitalization". Banksdaily.com. Retrieved February 27, 2015. ^ a b c d Emma Thelwell (January 24, 2008). "Société Générale: A history". The Daily Telegraph. London. ^ "Discover Societe generale in Russia". Societegenerale.com. Retrieved May 13, 2016. ^ Carley, Michael Jabara (1990). The international history review - From revolution to dissolution : The Quai d'Orsay, the Banque russio-asiatique, and the chinese eastern railway, 1917-1926 (PDF). Taylor & Francis, Ltd.
^ a b c Rothery, C. (Producer). (2003). Masterminds [Television series]. "The Riviera Job." Season 1 Episode 15. Canada. "Archived copy". Archived from the original on March 9, 2016. Retrieved 2016-11-30. CS1 maint: Archived copy as title (link). Retrieved June 18, 2011. ^ AFP (February 12, 2018). "Suspected mastermind on trial for France's 'heist of the century'". www.theguardian. Retrieved January 31, 2019. ^ Jacobs, Julia (January 31, 2019). "A Secret Tunnel Leading Toward a Florida Bank Puzzles the F.B.I." www.nytimes.com. Retrieved January 31, 2019. ^ Corcoran, Jason (September 5, 2011). "Troika's Deputy CEO Der Megreditchian Leaves After 11 Years". Bloomberg News. Retrieved March 4, 2014. ^ "Building Mortgage: Pamplin alumnus James Cook has been in on the ground floor of Russian influence" (PDF). Pamplin College of Business. Fall 2008. p. 6. Retrieved October 31, 2016. The mortgage bank, DeltaCredit, became the top mortgage bank in Russia; in 2005, the French Société Générale acquired it for $100 million. ^ Agence France-Presse (January 24, 2008). "Rogue trader blamed for 4.9 billion euro fraud at Société Générale". Archived from the original on January 27, 2008. ^ "Press release" (PDF). January 24, 2008. ^ Hosking, Patrick; Bremner, Charles; Sage, Adam (January 24, 2008). "Jerome Kerviel named in €5bn bank trading fraud". The Times. London. ^ a b "Kerviel's fine the size of 20 Airbus A380s". Reuters. September 28, 2010. Retrieved October 5, 2010. ^ "Kerviel lawyer says to appeal court verdict". Reuters. October 5, 2010. Retrieved October 5, 2010. ^ Clark, Nicola (October 5, 2010). "Rogue Trader at Société Générale Gets 3 Years". The New York Times. ^ "Société Générale". Mail on Sunday. August 9, 2011. ^ "Legal information". Societegenerale.com. Retrieved September 24, 2009. ^ "Standard Ethics Italian Index". Standardethicsindices.eu. Retrieved February 11, 2018. ^ "Société Générale and Nestlé looting Africa: The SIPL affair". Afrikonomics.com. May 3, 2016. Retrieved May 13, 2016. ^ Nate Raymond, Jonathan Stempel (February 27, 2014). "Societe Generale to pay $122 million to resolve U.S. mortgage lawsuit". Reuters.com. Retrieved May 13, 2016. ^ "SocGen facing bribery lawsuit over Libyan deals". Reuters. March 31, 2014. Retrieved May 13, 2016. ^ "SocGen accused over Libya deals". Financial Times. ^ Anne Steele (February 24, 2016). "Natixis, Société Générale Settle Municipal Bond Fraud Charges". Wsj.com. Retrieved May 13, 2016. ^ Victor Reklaitis (April 4, 2016). "Panama Papers chart: 10 banks that asked for the most offshore companies". Marketwatch.com. Retrieved May 13, 2016. ^ "Societe Generale Headquarters Searched in Panama Probe". Reuters.com. April 10, 2016. Retrieved May 13, 2016. ^ Michael Stothard (April 11, 2016). "SocGen chief to testify to French senate on Panama Papers". Ft.com. Retrieved May 13, 2016. ^ Maya Nikolaeva, Julien Ponthus (May 11, 2016). "SocGen's Oudea defends bank over Panama Papers". Reuters.com. Retrieved May 13, 2016. ^ "No 'joke': SocGen admits fault, pays $50 million in U.S. fraud case". Reuters. January 20, 2017. Retrieved January 21, 2017.